The Northcote Heavy Horse Centre is a small and unique but extremely dedicated animal welfare charity in Lincolnshire specialising in horses and horse welfare. The centre has been running for over 25 years and is entirely funded by the generosity of the public and donations, we receive no major funding. We do everything we can to give the horses and animals in our care the best possible home whilst giving them a rich and rewarding life. Many of the horses come from broken backgrounds, some have even been abused or mistreated and others simply come from owner circumstance where they can no longer be looked after. Some of the horses have medical conditions and require extra special care, sadly even some of the larger UK animal charities turned them down because they were deemed too cost 'ineffective'. We take on the responsibility and give them the love, devotion and respect that they deserve. The Heavy Horse Centre also runs a popular visitors centre and attraction and has attracted thousands of visitors over the past 25 years. We offer a very unique opportunity for visitors of the centre to get up close to the horses and even lead or groom them, giving the chance to experience real hands on time with a horse. Many visitors feel the horses have a very calm, relaxing and soothing effect on them. To help raise vital funds we organise larger special events such as our popular Medieval Tournaments where our very own horses train and take part in Medieval Riding skills and more. As you can imagine it costs a lot of money to care for all of the horses and animals in our care and like most other charities we struggle. We are entirely self funded by donations from the public and income from our visitors centre, special events and online shop. We also run entirely by unpaid volunteers who give countless hours of dedication towards the horses and centre. To help fund our large winter feed bills we create a gift catalogue filled with great horse related gift ideas for Christmas. Items can be bought from our online gift shop at www.heavyhorsegifts.com. If you could help the Northcote Heavy Horse Centre and leave a small donation please see our help page for more information and charity donation links. Beginning the Northcote Heavy Horse Centre was the original idea of Keith & Ruth Sanders in 1988. Following a long standing family hobby, the chance to have Ebony back after his working life at Young's Brewery in London; (Ebony was owned by the family from being 3 years old until the age of 7 when he went to London) stimulated the idea of creating something worthwhile. The Centre opened in July 1989. Faith plays a major part in our life here in Rural Lincolnshire. Without faith and help and guidance from our creator we could not have survived the bad times in the mid 1990's and the "Foot & Mouth" epidemic of 2001. We only have the money we can earn by our own merit and the help we receive from our supporters and "friends". The care problems of Big Horses with big problems are a constant worry. Development of the Centre has changed direction from its simple beginnings; ordained mainly by demand on the family to create a "haven of rest and tranquillity" for visitors and horses alike! Visitors and the helpers themselves are strongly influenced by close contact with these large, impressively intelligent and calming animals. One of the highlights of our life was in 1993 when Keith was nominated by his peers for inclusion in the Miller Reference Guide "Best of British Men". This was for his work in bringing horses and people together and improving understanding and enjoyment of heavy horses. The most memorable and moving "happening " was when Pam Rhodes and the BBC "Songs of Praise" team arrived at the Centre to film part of the 1995 "Harvest Festival" programme. Today, the Centre is a non profit making organisation, run entirely by voluntary helpers, with the intention of continuing the work already established here. Providing a home and caring facilities for horses with particular needs. We earnestly believe that these horses who have given their all in their working environment, should be allowed to enjoy the remainder of their lives in a happy, caring environment where they can contribute to the happiness of others. Over the last 19 years we have positively established the fact that the horses love to work. They benefit by being needed. Working within their individual capabilities they have an increased sense of well being and contributing to the general need. 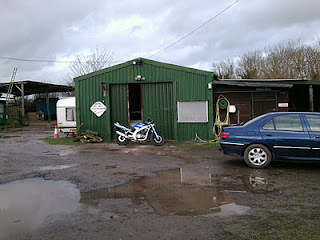 The Centre also caters for horses that are disabled but still able to enjoy a good quality of life under care. A nucleus of fit working horses undertake most of the day to day tasks around the centre. Funding towards our annual operating costs is made up mainly from receipts from visitors, donations from friends, fund raising activities and income from special events. In 2003 we created our very first MEDIAEVAL DAY. On the last Sunday of August over 800 people came to see our costume pageant with all characters and horses in authentic mediaeval garb! The horses loved taking part in the "Riding Skills" with lance sword and javelin against quintain, quoits and various other static targets. "Medieval weekend" and a further fully costumed major projects are now annual events. Thank you for coming to see our pages. We would like you to visit us when you are in Lincolnshire. The Northcote Heavy Horse Centre is located on what was the WAAF (Women's Auxiliary Air Force) site No 2 of RAF Spilsby, the airfield was built early in 1943 as a heavy bomber base with 3 concrete runways the longest two were 600ft and all three were 150ft wide. 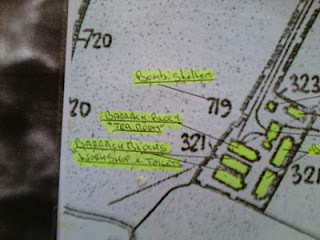 WAAF site 2 consisted of 5 barrack huts, 1 Ablutions/Latrine block, 2 sergeants quarters, 1 picket post and a bomb shelter. Two concrete barrack block bases survive, one is used for the Hens Nest tea room and one for the covered shelter opposite.